...GNOME developers are not “web-enabled”. We’re a bit like Microsoft in the early 90s: We focus on the local computer and ignore the internet. which, to my experience is somewhat true. I went to GUADEC for the first time in Dublin in 2003, with the specific mission of promoting integration between desktop applications and the various open source web tools like CMSs and CRMs. However, nobody really seemed interested at the time. Only now that cloud has been hyped for a long time, people are paying attention. 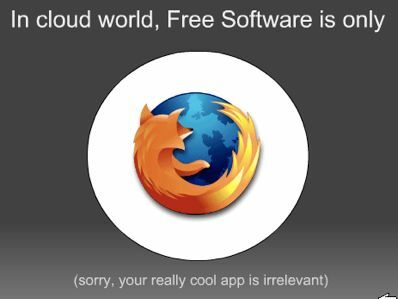 ...the cloud is a trap that will move your data, and your applications beyond your control to proprietary data servers and web applications run by multinational corporations. If free software doesn't provide a compelling answer to that, we risk irrelevance. Users flock to the cloud for two primary reasons: collaboration and convenience. Most "cloud apps" allow users to share data with each other and work collaboratively. From the Sugar project, GNOME already has technology for that, if it only was integrated in more applications. A replicated, peer-to-peer system of synchronizing and sharing your data could be the answer. And Midgard2 is a framework providing just that. Bindings to different languages like PHP, Python and Mono, interprocess communications via D-Bus and XMPP, replication, and ability to run the same software from big server clusters to Nokia internet tablets should all help us get there. If applications used Midgard's content repository for their data storage needs, it would be easy to synchronize the data between the user's all devices, and also make it accessible on the web thanks to Midgard's web roots.